There is nothing more satisfying than a generous serving of farm-fresh cottage cheese. We know people tend think of cottage cheese as old folks’ food. We think those people are in need of an attitude adjustment. These days, cottage cheese is all about young, slightly tangy flavor, whether it’s flying solo or with fresh fruits and vegetables by its side. In Wisconsin, we don’t discriminate. Wholesome and versatile cottage cheese is for anyone and everyone! Cottage cheese is tasty right out of the refrigerator to just shy of room temperature. When it gets to room temperature or warmer it loses its charm. 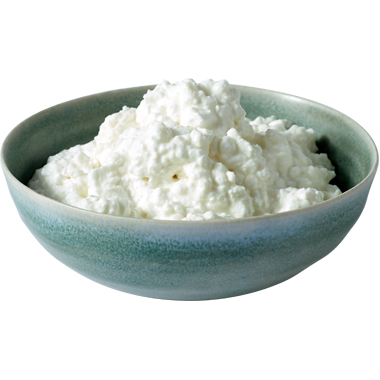 If you add any sort of sauce or dressing to cottage cheese that’s too acidic, it tends to break or separate. Don’t do that. Do, however, scoop it onto the top of already tossed salads. Light and bright works best with cottage cheese, so we love young and unoaked whites like pinot gris, riesling and sauvignon blanc. Cider works well, and beer too. In that case, we lean toward lighter pilsners, wheat ales and American pale lagers. When it comes to cottage cheese, we like to keep it simple with our Wisconsin cottage cheese. Put it out with thickly sliced homegrown tomatoes and drizzle it with olive oil, salt and pepper. If our sweet tooth has a say, then we like it with chunks of fresh pineapple, nectarine or peach. Basically, anything with a touch of acidity and a lot of fresh-picked-and-ripe flavor goes well with Wisconsin cottage cheese. We also love to swap it in as a light-on-its-feet substitute for ricotta in lasagna.